Tonight on ABC their hit crime drama CASTLE returns with a new episode called “Disciple.” On tonight’s show Castle and Beckett are shocked when their murder victim looks like Lanie. Did you watch the last week’s season 6 episode 7? We did and if you want to get caught up, we have a full and detailed recap, right here for you. On last week’s episode when a famed relationship therapist was murdered, it appeared that her access to the secrets of her elite and powerful clients led to her death. But when Castle and Beckett discovered the victim was in possession of a rare object worth millions of dollars, they realized that this case may be even more complicated – and dangerous – than they though. On tonight’s show Castle and Beckett arrive at a crime scene to discover that the female victim bears a shocking resemblance to Medical Examiner Lanie Parish. As the team tries to make sense of this mystery, they realize the killer may be targeting detectives of the 12th Precinct. Annie Wersching (“24”) guest stars as Dr. Kelly Nieman, an exclusive Manhattan cosmetic surgeon who draws Castle and Beckett’s interest because of her connection to the victim. Tonight’s episode is going to be great and you won’t want to miss it. So be sure to tune in for our live coverage of ABC’s Castle tonight at 10 PM EST! 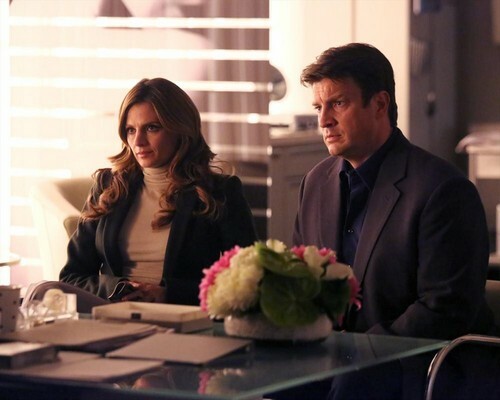 While you wait for our recap, hit the comments and let us know what your think of Castle season 6, so far? Also check out a sneak peek of tonight’s episode below! A security guard is patrolling an alley at night with a flash light, he asks a homeless man to “move along.” He sees a woman standing on a bridge, her back is turned, so he can’t see her face. He moves closer and realizes she is hanging in the air, there is about a foot between her feet and the ground. Castle and Beckett are trying to plan their honeymoon, Castle wants to go somewhere relaxing. Beckett reminds him they haven’t even set a date for the wedding yet. Beckett suggests several honeymoon locations, but Castle has been to all of them with Meredith. Castle and Beckett arrive at a crime scene. Ryan says they found a woman hanging from a beam, they have ID’d her as Pam Hodges. She is Lanie’s doppelganger, they look like twins. She died from strangulation. Javier and Ryan bring in Pam’s uncle for questioning. Her Uncle says she had a job offer, she was happy and turned her life around, and she was no longer working the streets. She never told her Uncle what the job was, he gives them her address though. Lanie calls Beckett down to the coroner’s office. She is freaked out. Pam Hodges had cheek implants to make herself appear more like Laney. And she got the same exact tattoo in the same exact spot as Laney. Someone went out of their way to make Pam Hodges look like Laney. Beckett shares the news with her team that Pam was trying to look like Lanie. They are going to try to trace the serial numbers on her cheek implants. They trace them to a plastic surgeon in Manhattan. Esposito has to question Lanie about her doppelganger. She has only had her tattoo for three months, someone had to have seen her naked. She reveals that she went out a few months ago, and has no idea how she got home. She thinks she was roofied. They find a photo on the digital camera that had been deleted, it’s a selfie the victim took the same day she was murdered. She is on a boat, and they think they can trace it to an owner. Castle and Beckett are questioning the plastic surgeon that helped Pam Hodges look like Lanie. Dr. Nieman says Pam brought her a photo of another woman, and asked to look like her. The photos looked like they were taken in a bar. Hodges paid for the surgery with a company check from Greg’s Baker. Beckett receives a phone call from Ryan, he has located the boat, and the SWAT team is about to board it. The boat is registered to a Rudy Hollings. They find a man hanging in the boat, with his back turned, just like Pam Hodges. The new victim is a dead-ringer for Esposito. The new victim is named Daniel Santos, he moved to NY a year ago from Georgia. He used to be a stripper, and just like Pam Hodges he told his family he had gotten a new job. Rudy Hollings, the man who owns the boat has been out of the country for over a year. They track Santos credit card, and find he had an appointment with a therapist every week. Dr. Fuller isn’t your typical therapist, he is a speech therapist. According to Fuller, Santos was trying to get rid of his Southern accent, and he had brought in an audio file of someone talking, and said he wanted to sound like that person. Fuller plays the audio file for Castle and Beckett, and it is clearly Esposito’s voice. Esposito and Hodges are freaked out. They think it is someone who knew about their relationship, and is out to get them. Esposito promises Lanie that he won’t let anything happen to her. They track down an address for Daniel Santos, and Esposito and Ryan check it out. A woman sees Esposito in the hallway and mistakes him for Daniel. She said no one ever visited Daniel, but a limo picked him up two nights ago. They track down the limo, and the limo company tells them that they dropped Santos off at the same apartment of the person who ordered the limo, Dr. Kelly Nieman (the plastic surgeon). They speak to Dr. Nieman’s doorman, and he says that Santos has spent the night at her house several times. They have no substantial evidence against Dr. Nieman, they have one shot to question her. She isn’t upset that Santos is dead, she says their relationship was purely physical. Nieman says that Daniel left her house around ten. According to Nieman, Daniel referred Pam Hodges to her. Nieman is very cocky, she tells Beckett someone is clearly setting her up, and that she has dated lawyers and she knows that they can’t hold her. Beckett is rattled by her, she thinks that Nieman is “toying with her.” Castle thinks that Nieman may actually be innocent. Ryan reveals that Nieman’s alibi is iron-clad. They pull the security cameras from Nieman’s apartment and see that Santos left her apartment at 10:07 PM and got into a car. They are able to pull the parking pass on the car’s window and trace it to a man named Carl Mathews. Carl Mathews is the security guard from the dock that discovered Pam Hodges’ body. They put out an alert on Mathews, and try to locate some of his family. Castle doesn’t buy that Carl Mathews is the killer. He thinks Matthews has a partner, there is no way he could have pulled this off by himself. Castle has a hunch that this case is related to Jerry Tyson, a man that escaped from them in the past. He tried to pull the “3XK” files from evidence to see if Carl Matthews can be linked to Jerry Tyson, but the files are missing. According to the log, Esposito signed them out three days ago. Esposito says he did no such thing. The team realizes Santos impersonated Esposito and signed out the files. They call the coroner’s office and find out that Pam Hodges also impersonated Lanie and signed out all of the DNA samples and tissues from all of Jerry Tyson’s victims. They locate Carl Matthew’s car at a motel, the driver is check in to Room #47 (the same room that Tyson checked into when they were investigating the murders he committed). Beckett and the team kick in the door, while Castle stand outside nervously. Castle sees a man walking down the street with a backpack, it is Carl Matthews. He tackles him and takes him into custody while the team is still inside. They bring Carl in for questioning. They found a roll of wire in his backpack, and it is the same wire used to strangle Hodges and Santos. He confesses to the murders, too easily. Beckett and Castle don’t buy it. They know he is working for Tyson, but he won’t admit it. They catch him in a lie about his Greg Baker’s account.